Further analysis by the nonpartisan advocacy group RespectAbility shows that Oregon has dropped from 19th in the nation for employees with disabilities to 26th as other states have outperformed the Beaver State during the same time. Said Jennifer Laszlo Mizrahi, president of RespectAbility, “It is exceptionally bad news that as things have improved nationally for people with disabilities, that Oregon has taken such a big step backwards. 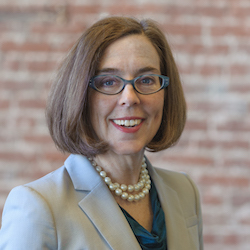 People with disabilities want jobs, just like anyone else.” Mizrahi recently met with Oregon Governor Kate Brown to discuss these issues. Many of the essential building blocks are in place for great success among job seekers with disabilities. In January 2018, new rules were announced to advance the state’s Employment First policies putting the highest priority on employment opportunities for youth with disabilities. Likewise, Project SEARCH, a nationally transformative school to work transition program for youth with disabilities, has been expanded across Oregon with a new effort at the Portland Water Bureau. At SEARCH sites in Eugene, Clackamas and Hillsboro, young people with disabilities have the chance to explore careers in the expanding healthcare industry.